Big news today is the launch of Microsoft Office for Apple's iPad. 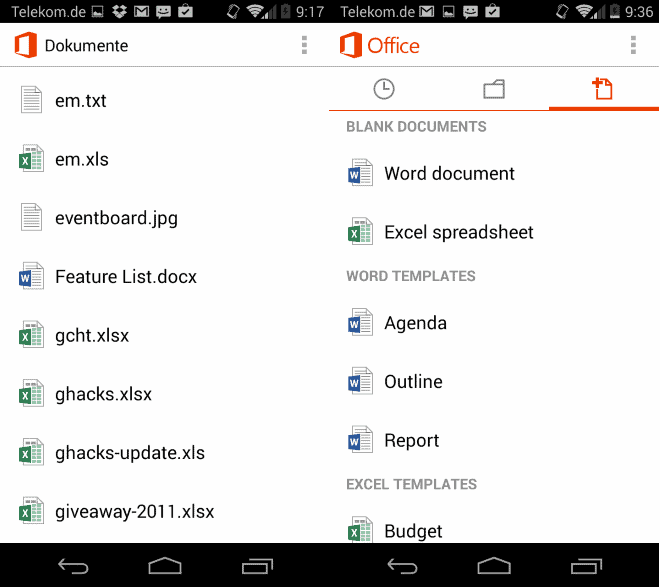 What most tech sites seem to have missed is that there are also changes for Microsoft Office Mobile for Android. The software was previously only available to Office 365 subscribers, but this is not the case anymore. What this means is that you can head over to the Google Play store right away and download Office Mobile for your Android device even if you are no subscriber of Office 365. As far as other requirements are concerned: you still need a Microsoft Account to use Office Mobile. You can either sign in using an existing account or create a new one in case you do not have one yet. Note that you may need to verify the account on first sign-in, which means that Microsoft will send a code to your email address or mobile phone which you need to enter in the application before it becomes fully available to you. Another requirement is that it is only compatible with Android 4.0 or newer systems. Last but not least, the app is only free for personal use. If you are using Office Mobile in a business context, you need a Office 365 subscription. Since you are signing in with a Microsoft Account, you get access to OneDrive at the same time. This means that you can open documents that you have stored on OneDrive using Office Mobile. As far as features are concerned, you can open Microsoft Office document using the application. It supports Microsoft Word, Excel and PowerPoint documents, and while reading is fine, it is also possible to edit documents directly on the mobile device. The editing functionality is quite basic though, and you should not expect all functionality of Microsoft desktop software or its online pendant Office 365 when you are using the app. In fact, there is not much you can do in terms of editing besides adding, modifying or removing text, and using several basic text formatting options such as making text bold or changing font colors. It is less than what a rich text editor would offer on the desktop, but more than a plain text editor supports. The Excel module offers additional features including options to sort of format cells, add comments, or to display the sum of values in select rows of the table. PowerPoint presentations can be added as well, but here you have basic editing options only as well. They are very similar to what the Word editor has to offer in terms of functionality. You can create new documents using the mobile app. As far as this is concerned, only Excel or Word documents can be created, and they can either be blank documents or based on a handful of templates the app ships with. It is possible to add more templates from your PC to OneDrive so that you can use them to create new documents. This is probably the better option, considering that you can also add PowerPoint templates this way that you can edit then in a basic manner. The editing functionality for new and existing documents is identical though. 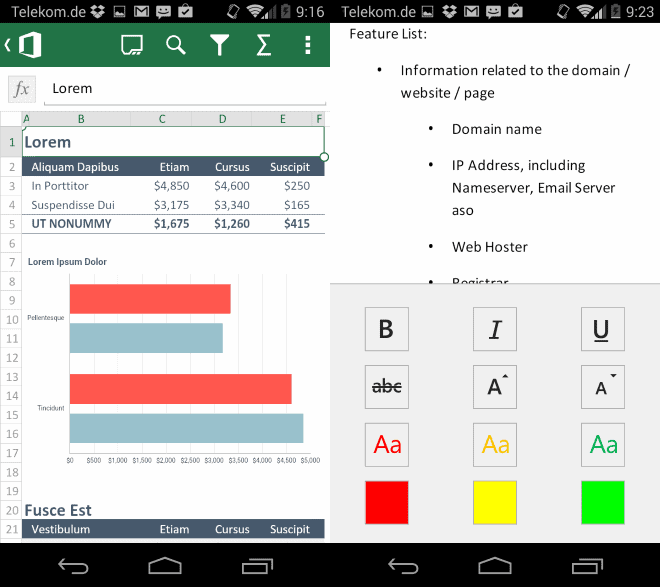 Considering that the apps' editing functionality is rather basic in comparison to desktop Office programs and Office 365, Office Mobile's main use is that you can read documents while you are on the go. It also allows you to make basic changes to documents, for instance spelling corrections, rephrasing sentences, or adding information. It is not suitable for heavy editing, as it lacks basic options such as adding headings to Word documents or background images to PowerPoint presentation sheets. This is a smart move on microsoft’s part… I am glad they are expanding their roles into other systems. I confirm that from my persona experience and from some info I gathered, it works only on smartphones and it’s not compatible with Android tablets, which is not good. @Trebuchette : Thank you for this info. At the moment they are leaving behind a very wide group of Android tablets users.